Elisabeth, Katharina, and David at the CfA. Today I’d like to feature 3 papers from students working at the Center for Astrophysics (CfA) that have recently appeared on the ArXiv. Elisabeth Newton used strong lensing to study faint and small galaxies (she studies M-dwarves and planets now). David Long is visiting from Ireland’s Trinity College and investigating tsunamis on the Sun. Katharina Immer is mapping the Milky Way and is from the Max Planck Institute for Radio Astronomy in Germany. 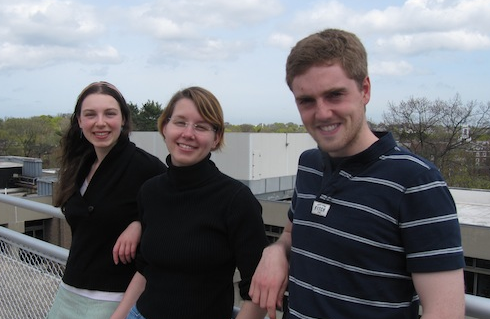 Both David and Katharina are visiting the CfA through the Smithsonian’s Predoctoral Program. The Sloan Lens ACS Survey. XI. Excerpt from Figure 1 in E. Newton et al. 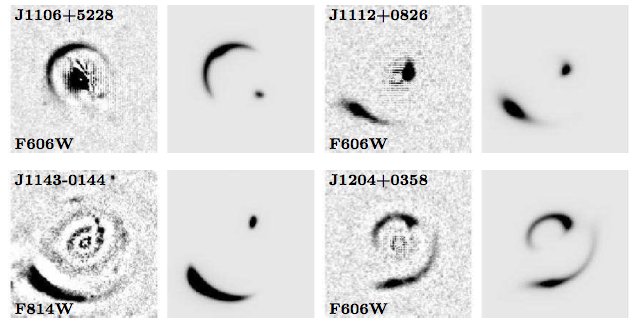 's paper: Sample subtracted HST images (left) and model predicted images (right). Astronomers, like any kind of scientist, are always trying to push the envelope and find things farther, better, faster, and smaller. Using the magnifying power of strong lensing the authors studied 46 small, far, and faint galaxies. Gravitational lensing is the phenomenon where the gravitational potential of massive galaxy clusters can bend and ‘focus’ the light of distant galaxies, effectively acting as a cosmic telescope. Lensed galaxies can appear very warped (see figure on left) so to play this game you must model both the background galaxy (“the source”) and the gravitational potential of the foreground galaxy (“the lens”). Comparing their model fits to work done in other papers, the authors are able to both check for consistency and estimate their own systematic errors. The techniques featured in this paper can be used to find galaxies nominally outside of the Hubble Space Telescope’s resolution limit. Pushing detection boundaries and finding samples of extreme objects tests theories and expands analysis. From the movie accompanying D. Long et al. 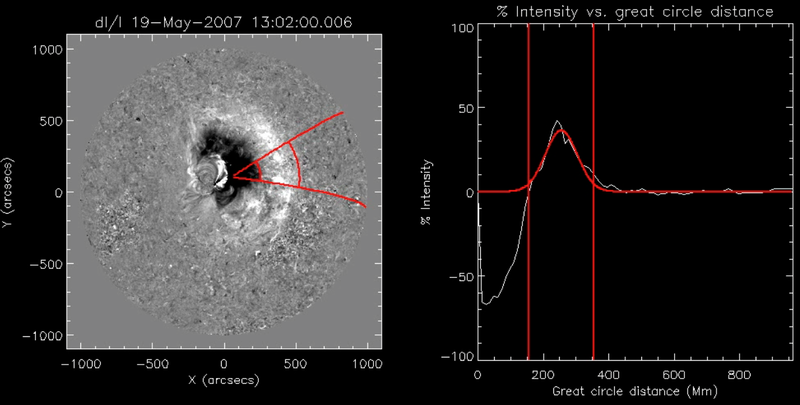 's paper: The left panel shows the Sun's disk and the right is the intensity profile with the vertical lines corresponding to the arcs drawn in the left panel. The EIT wave is the bright, white arc on the Sun's disk. The Sun is a very dramatic place, but one of the most spectacular phenomena are “EIT waves” (named after the instrument that first detected them). These huge, diffuse, wave-like fronts move radially across the disk of the sun at 100 – 700 km/s and both their propagation and generation mechanisms are still largely unknown. This paper focused on using high cadence observations from the two STEREO spacecraft to study the evolution of these waves over time. Plotting line intensity across the disk of the Sun every 1.5 to 20 minutes (depending on the wavelength), the authors could study the kinematics, integrated intensity, and temporal width of the wave. Importantly, the authors applied their analysis to multiple events, testing the robustness of their model, and found consistent results. Taken together, the results indicate that these waves are dispersive. The 10 second cadence of the SDO spacecraft should provide more insight into these mysterious events. Table 1 from K. Immer et al. 's paper: The exquisite precision of these calibrators' positions will help tell us what the Milky Way looks like to an extragalactic observer. Lacking a cosmic mirror, we cannot see the face of the Milky Way and so its structure is not well known. The Bar and Spiral Structure Legacy (BeSSeL) survey will use VLBA observations to find the distance and motions of water and methanol masers in our galaxy. Mapping these star forming regions will determine the spiral structure and kinematics of the Milky Way. The high precision measurements required for this ambitious project require excellent calibration. For radio observations, changing weather and instrument conditions require alternating between your science object and a well understood source such as a quasar or planet nearby in the sky. Consequently, finding and characterizing lots of calibration sources is very important for doing any science with radio telescopes. This survey targeted 1529 objects from VLA surveys (NVSS, CORNISH) and used the high resolution of VLBA observations to try to detect the source, reliably determine its position and characterize its quality as a calibrator. The authors present new data on 199 radio calibrators that will be useful not only for the BeSSeL survey, but also for EVLA and ALMA science. The Fate of the Milky Way The Hot, Irradiated Center of our Milky Way No jets in the Galactic center? What would a binary black hole merger look like?